Who’s up for a little trip to Minnesota on September 11? 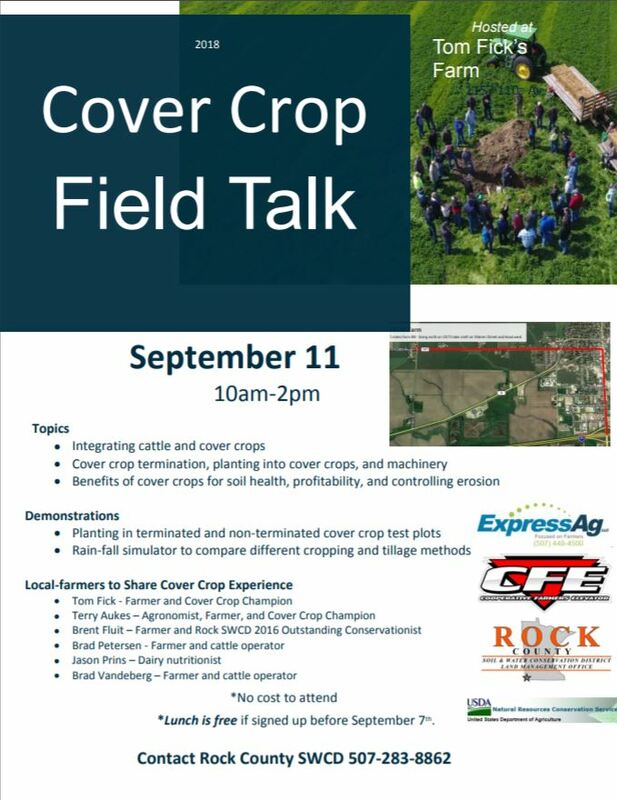 The Rock County Soil and Water Conservation District, along with the NRCS, Express Ag, and Cooperative Farmers Elevator, are hosting a “Cover Crop Field Talk” at Tom Fick’s farm (1157 110th Avenue, Luverne, MN). It starts at 10am and will end at 2pm, and if you register by September 7, you’ll get a free lunch! Along with talking about cover crops, there will be demonstrations and local farmers sharing their experience. And it’s all FREE! Click on the picture below to print the flyer. See you there!